Home Digital Magazine Oslo Accord: A missed opportunity of peace? Oslo Accord: A missed opportunity of peace? Terje Rod-Larsen, serving as a Director of the FAFO Institute, played a key role in the negotiations that led to the Oslo Accord – the first-ever agreement between Israel and the Palestine Liberation Organisation (PLO). In 1993, he was appointed Special Adviser for the Middle East Peace process to the Norwegian Foreign Minister, and in 1994, he became the United Nations Special Coordinator in the Occupied Territories. He served as Norway’s Deputy Prime Minister in 1996. Later he returned to the UN, serving in different positions for working on the Middle East peace process. In 2004, he became President of the International Peace Institute (IPI). GVS: IPI was created by the UN in 1970, as a training institute for military and foreign officers. So how have you transformed it since 2005? Terje: It was actually an initiative taken by former Secretary-General, U Thant (of then Burma, now Myanmar). He wanted to have the institute as a think tank within the UN, but mainly for the purpose of conducting studies, and training of military officers and civilian personnel of UN peacekeeping operations, which were growing exponentially at the time. But there was resistance from the Soviet Union on creating such a think tank because they were very hesitant about the growing UN peacekeeping operations. He then turned around, found benevolent donors and established this organization, with donor money, as an independent think tank outside the UN, but located across the street from the secretariat building. So we are independent, but the UN Secretariat General is the ex-officio or the honorary chair. Afterwards, for around 30 years, the organization was focused mainly on studies related to peacekeeping operations and the training of officers and civilian personnel for peacekeeping operations. Basically, teaching all these guys how to make peace and not to make war. Then, this function, after the demise of the Soviet Union, was integrated into the UN Department for peacekeeping operations. My two immediate predecessors, Olara Otunnu the former Foreign Minister of Uganda and Canadian Ambassador David Malone, transformed the organization gradually into a think tank on all issues related to the UN, and the training function, more or less, disappeared. When I came on board, I continued on that and made it into a think tank, the way it is today, and changed the name from Academy to Institute because we were no longer a training facility. We also expanded the operations fundamentally; when I arrived, it was 10-12 people and today we are between 50-60. GVS: How would you explain IPI’s current work and mandate? Terje: IPI rests on two pillars. One is that we are an events machine, where we organize 130 events a year on average, and the second pillar is that we are policy researchers. We like to say that we are not only a think-tank but also a do-tank, because we always conclude our research with advice about what to do. Our main clients are International and multi-national organizations; first and foremost, the UN, then also a lot of regional organizations along with the member states of the UN. So, we research and conduct events on basically every single topic which is on top of the UN agenda. GVS: In a world where multilateral institutions and multilateralism is now under challenge and is becoming weak, how do you view at these challenges? Terje: In a way, IPI is, even more, an absolute necessity related to the UN, because we are not steered by anyone. So, we can have discussions and bring up topics without the rules and regulations, that the UN has to follow as a rule of procedure. So very often, when hot topics are in the Security Council, the debate continues at IPI and its very interesting that the President of the council, which is rotating, by and large, has all the monthly working lunches with the Secretary-General and the top staff of the Secretariat at the IPI. So, we are an independent organization where any discussion can be held on the most difficult topics, without rules and regulations. Some of our events are public with the media, which are live-streamed and others are under Chatham House rules without any reporting. Read more: GVS exclusive interview with Imran Khan; his vision and his priorities. GVS: You have mentioned difficult moments, but as the Director of the FAFO Institute, you worked on negotiations between the PLO and Israel, which led to the Oslo Accords in 1993-95. 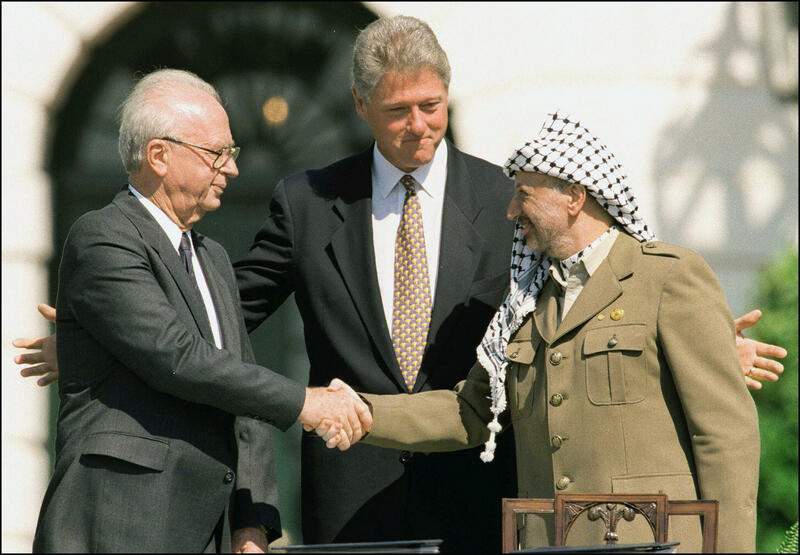 Reflecting back, do you think that the Oslo Accords were a mistake, a misconception or flawed to begin with? Terje: Let me first say that in a way, FAFO my research institute at the time illustrates my previous point. Because the talks were financed by the Norwegian foreign ministry and to keep things totally secret in a ministry is very difficult. So, there was an agreement that the Foreign Minister would finance the talks and I would report to the Minister and his staff (my wife was one of them); the talks were organized by the research institute and because it was independent they remained secret until we wanted to make them public. Now, the Oslo Accords are many things. Its an ideology, to put it that way, mandating a two-state solution, which remains broad consensus in the international community – with a broad support from both the Palestinian and the Israeli side though the current government of Israel is not moving forward in that direction. So, in that sense, you can say that the ultimate goal of the Oslo process has not been fulfilled. GVS: But is it just the current government of Israel or has the Oslo Accords created a fear and insecurity in the Israeli politics, leading to the rise of the right wing and leadership like Netanyahu? Terje: No, I think that is a complete misunderstanding. In Israel, and paradoxically also on the Palestinian side, there are different positions. First, on the Israeli side, there is a non-state position, which aims for a ‘Greater Israel’ to encompass both Gaza and the West Bank; that is a non-state solution for the Palestinians which leads to the one-state solution for Israel. On the Palestinian side, paradoxically, some have the same position, the difference is that on the Israeli side, those who are standing for the non state and one state solution, believe that the Palestinians should not revolt in riots, so that Israel can remain a Jewish state, but with a huge number of Palestinians in the future, because of the demographic developments. While of course on the Palestinian side, the opinion is that everybody should revolt in riots, which means that there will be a Palestinian majority in a one-state solution. GVS: But, could there not be a one-state solution, in which there could be a restricted adult franchise to begin with, on property and education, which can further be expanded the way it happened in countries and states like Britain in the early 20th Century? Terje: Yes, of course, that’s definitely a theoretical possibility but this a position which has very little support on the Israeli side and the new Knesset law illustrates my point. GVS: Moving forward, we have seen that in Washington, the Trump Administration is making unilateral decisions, like shifting of the American Embassy to Jerusalem and recently cut aids to the UN Relief and Works Agency. Where do you see things going now? Terje: I don’t think that this is a very wise move, of course, it is fundamentally undermining Palestinian living conditions in the most dramatic way. But I also think that this is fundamentally not in the Israeli interest either, because this will undoubtedly stoke radicalization amongst the Palestinian population, which might pose a massive security risk for Israel. So, this is not a step of wisdom. GVS: At the same time, many people have observed that the Arab leaders are increasingly ignoring the Palestinian issue, and their talk in public forums is focused on the threat from Iran. How do you think has this changed the dimension and contours of the Palestinian issue for the world? Terje: I think in some ways, the Palestinian issue has moved more to the margins of the focus in the region; being replaced by what is being perceived as an Iranian quest for dominance and hegemony in the region, operating through various proxies in multiple Arab countries. So, this is at the forefront in the minds of Arab leaders. Of course, the Palestinian issue is still there, as illustrated by the move of the U.S. embassy to Jerusalem we should remember that the issue of Jerusalem is not only a Palestinian issue, it’s also a Muslim and a Christian issue. So, the protection of Jerusalem as a holy place for all three religions is very important. I also think that this move has undermined the credibility of the U.S. as a broker in the Arab-Israeli conflict. GVS: Now, while countries like Egypt, Jordan and Turkey recognize Israel, Palestinian authorities recognize Israel as a result of the Oslo Accords; if Pakistan recognizes Israel, do you think that it can help the situation? Terje: My opinion is always that the policy of the empty chair doesn’t work. You don’t have to make peace with your friends, you have to make peace with your enemies and in order to make peace with your enemies, you have to speak to your enemies. Now, we have had, by and large, more than 50 years of a boycott of Israel not allowing them to sit at the table I don’t think that’s wise. Much can be criticized about Israel’s handling of Arab issues particularly the Palestinian issues – however, there should be a dialogue because without talking you can never find a solution. So, I will urge everybody to sit at the table and have the same position. GVS: Sitting at what table? The UN? Terje: I think the only organization in the realm of International politics, where everybody sits at the table, is the UN and that’s the uniqueness of the UN. For example, we have, a couple of times, organized meetings with Arab foreign ministers in New York and on two occasions I personally invited Israeli Foreign Ministers to participate; but some of the Arab states walked out when Israel walked in. And I don’t think that’s wise, they should remain seated and have a dialogue. GVS: There is another conflict pending for more than 50 years now, the Kashmir issue, where people suffer tremendously. It was a United Nation issue but has been totally forgotten and is now out of the international community’s radar. What can be done? What went wrong on the Kashmir issue? Terje: It is important to understand that if the UN is going to go in as a mediator, then both parties have to acquiesce with having a UN mediator. And in this case, both parties do not acquiesce because some – if I put it that way – see it as a way of internationalizing the conflict and they want to keep it as a bilateral issue. GVS: So, do you think that the international community cannot help the Kashmiris or bring peace to that region? Terje: I mean, as I said, the UN Secretary-General and Security Council have to see that the parties to the conflict agree on UN’s role. This is a part of the rules of the game as concerns the UN as a mediator to end conflicts. GVS: You are a European working on the international theatre, but Europe is also coming under fundamental changes as seen with Brexit and the rise of ultra-nationalistic right-wing governments across Europe. Where are things going in Europe? Terje: In a way, the migration which isn’t that big in numbers – to Europe has been a kind of 9/11 for the Europeans. It is a kind of revolution that has shaken up the political map of Europe and we see a rise of parties and organizations which are illiberal, xenophobic, populist and nationalistic; which is very worrisome because it threatens the fundamental European values like freedom of speech, the rule of law, tolerance, freedom of assembly, etc. This is also concerning because if you look at the demographic explosion expected in Africa and the MENA region. Given the weaknesses of many of these states, there is no capacity to sustain future predicted populations. For instance, Egypt’s population will double by 2050 and Nigeria alone will have more people than western Europe combined. And this has led to a situation where IPI’s recommendations to our European friends, is that they have to be as helpful as possible, to bring about sustainable states and sustainable economies in the MENA region and deep down in Africa. I am not calling for a new imperialism, but I am calling for a massive economic aid to the relevant nations. GVS: There was a hope that Europe would act together as a unified European Union on the international stage as a balancing act. Do you think that is still possible or have we lost that opportunity? Terje: I think that the European project is far from dead. It has been shaken by, first and foremost, Brexit, but I think that the idea of a united Europe through the European Union is so strong and is still supported by many people of the region, that it will survive and get stronger in the long run.